Murphy Monday: Four Years Old! On May 5th, Murphy will be four years old! Daisy and I went to see him on Friday. He’s so huge I can barely get a grip on all that giagantic-ness. I’m guessing he’s over 16hh. He’s still the same sweet, easy going boy that plopped out on Day One. This entry was posted in As The Hot Walker Turns, Barn Culture, Life and tagged Barbie, Birthday, Daisy, Growing Up, Murphy Monday on May 4, 2015 by Jane Clancy. It’s my birthday. I am AhMazing. But we knew that. FYI, I created that little guy nosing the pumpkin. See? AhMazing. That little guy? Our tiny Murphy? Murphy and Daisy both have portfolios with the Ford agency. Calvin Klein models. Happy Birthday to my niece and God mare, Barbie! This entry was posted in As The Hot Walker Turns, Barn Culture and tagged Barbie, Birthday, Daisy, Murphy on March 18, 2014 by Jane Clancy. This is Daisy’s mare, (and my niece) Barbie, hopefully in order of age progression. She turned 8 years old on Sunday. Barbie is Murphy’s mom, for those just joining us. 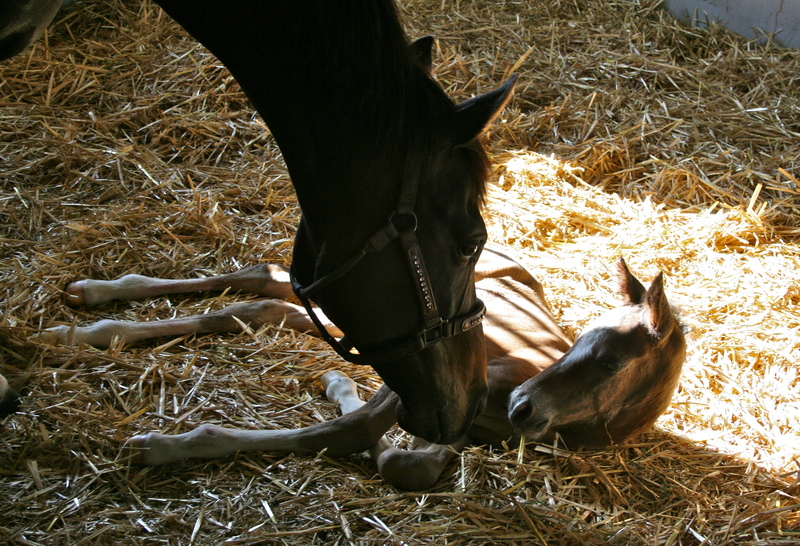 She needed to be retired early, but shines on: she is a wonderful mother. 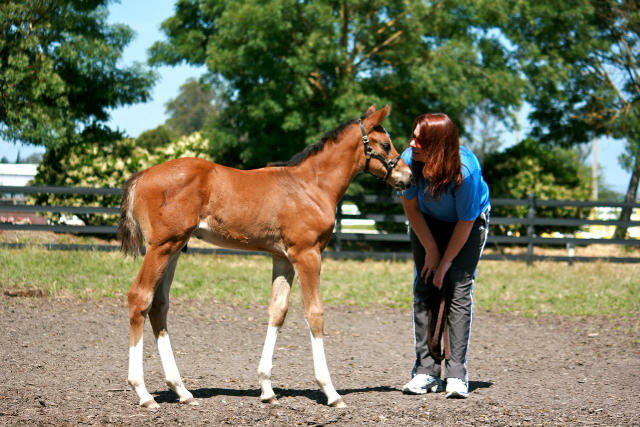 This is a mare you’d want to have a foal by. She was very strict with Murphy, saving humans a lot of work, which is probably partly why his manners have remained decent into the terrible two’s. 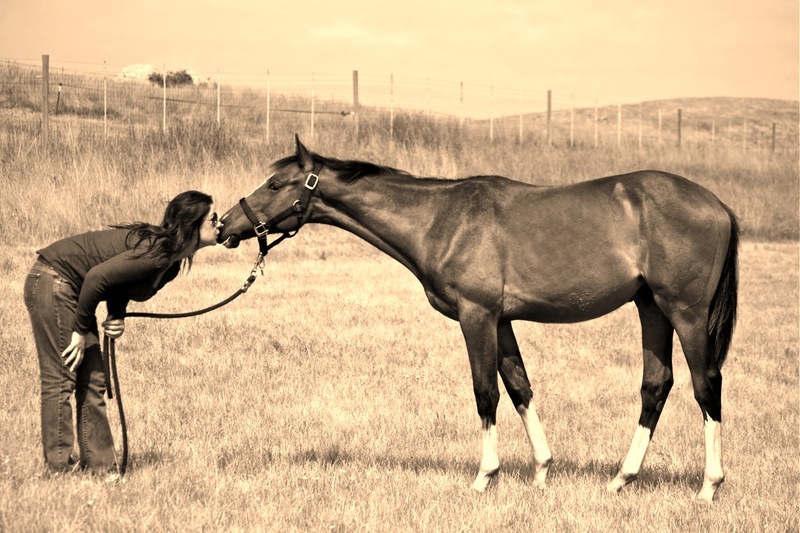 This entry was posted in As The Hot Walker Turns, More Photos Than You Care to See and tagged Barbie, Birthday, Broodmare, Daisy, Hunter, Thoroughbred, Warmblood on March 20, 2013 by Jane Clancy. Murphy Monday: Almost a Year Old! Murphy will be a year old on May 5th. Can you believe it? I am date challenged. When he was born on Cinco de Mayo (Mexican Independence Day) I was relieved. I’d never forget his birthday. Daisy moved Barbie to the same facility once Murphy was weaned. Princess Barbie has never been happier. Acres and acres of land to roam. The barn owner found her rolling in the pond. This is the horse that hated to get her feet wet. Clearly she’s modeling her new royal behavior after Princess Fiona from Shrek. Barbie is relaxed and happy. Yeah, I have to say that twice: Barbie is relaxed. It was almost too much of a shock for me. I recovered quickly. Daisy strapped a feed bag of grain over Barbie’s head, immediately annoying her. (There’s my niece!) Very un-royal looking. But it does keep her grain hers, and lessens her ability to fling it all over the pasture. Once Barbie is munching away, we turn to the baby pasture. It is instantly obvious someone has broken the rules about hand feeding the babies. We were mobbed. We had no food. Undeterred, they tried to root through our clothing, certain treats were hidden somewhere. Even with two of us, a baby escaped, and Auntie Jane had to use The Mane Grab and Cheek Lock to drag the baby back in, so Murphy and Daisy could escape. Daisy was busily multi-tasking, keeping the rest of the pack herd in, while attempting a Navy SEAL level extraction. Look, Auntie Jane! I’m old enough to shave!!!! He should be shed out a little more by his birthday. Hopefully we will have less shaggy baby photos…we might even get to see what color he will be. He was very wiggly and antsy – unusual for him. No good full body photos, I’m afraid. But he’s still our gorgeous boy! This entry was posted in More Photos Than You Care to See, Murphy Monday and tagged Barbie, Daisy, More Photos Than You Care to See, Murphy Monday on April 23, 2012 by Jane Clancy. Winter is due to stop by this week for a meet and greet. A few showers. I hope it brings a hostess gift. Something for in front of the fire? 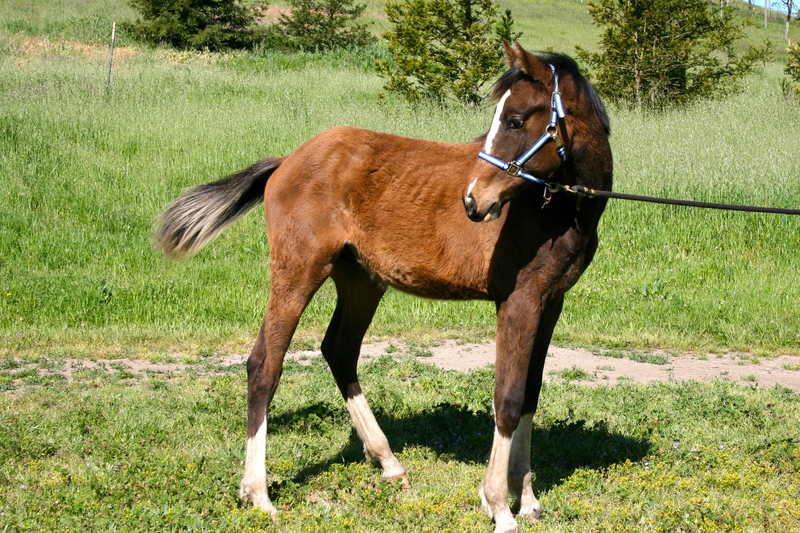 The foals have been moved to winter pasture: enough slant for drainage, but no hills that might get mucky and slippery. Today photos are in quarters also: Murphy was so cuddly and insistently affectionate, we could not get him far enough from the camera to get a decent full body photo. This is a kind of body-parts photo shoot. Daisy and I were much more about soaking up the affection than getting ‘good’ pictures. Below, Murphy looks up when he hears Daisy call him. I love that – if he can hear her – he comes when called. Apparently in winter quarters, mobbing the humans is not a requirement. Only Marilyn and Murphy mob Daisy. Murphy growth perspective: Daisy is 5′ 11″. Marilyn is a three-year-old. Marilyn helped Murphy tremendously with the weaning adjustment. It’s worth the few rounds of “flick the nose” we have to do to engage her memory that humans are higher than Queens in the food chain, and may not be run over or imperiously commanded to leave Murphy alone. When it’s finally time to go, Murphy takes Daisy’s departure easily, and walks back toward the other babies. Marilyn stops to redirect his focus when he looks back. He’s on higher ground, but their heights are not all that far apart. I can’t help but wonder how much taller our 7 month old boy is going to get. Daisy’s decided to move Barbie to the same facility. Barbie will be in the brood mare pasture. It will make Daisy’s life a lot easier to go to one place instead of two. The only foreseeable problem? Barbie is unlikely to come when called. But this is why there are buckets and grain that rattles. This entry was posted in More Photos Than You Care to See, Murphy Monday and tagged Barbie, Daisy, Foal, Horse, More Photos Than You Care to See, Murphy, Murphy Monday on January 2, 2012 by Jane Clancy. Murphy has a meet and greet with Uncle Melody. If they like each other, Murphy might move in. There is no tension, just curiosity. Then…grooming…? Really? Strike that. Why am I surprised? Melody is calm, stable, gentle, and sharing on the ground. (In the air is another matter: he is his own flyer. Co-pilots must listen to HIM.) Murphy is still incredibly easy going. Murphy was about 30 feet away. 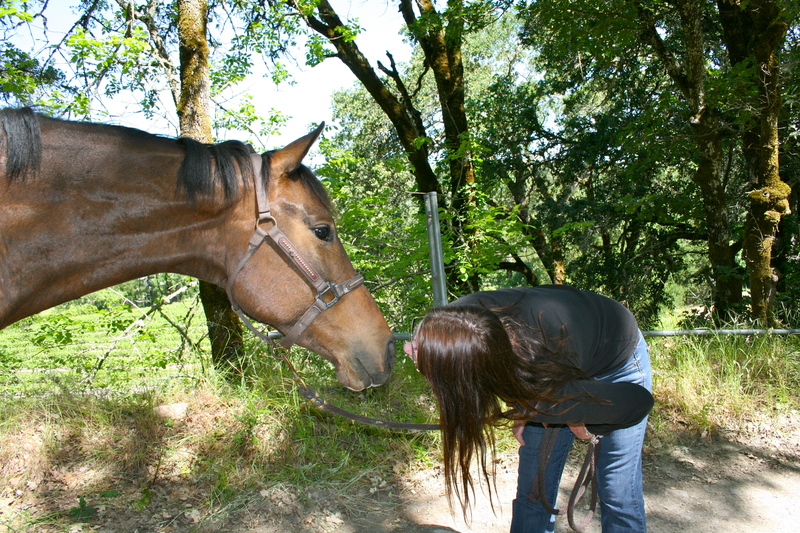 But he was touching noses with another horse! What if it’s not Melody? What if it’s a stranger that looks, sounds and smells like Melody? Did you think of that? HUH?!? Murphy is her first bonded pasture mate. His weaning will be a double whammy for her: losing baby, losing a pasture mate she’s hooked up with. Daisy has been highly conscious of this, and doing a thorough think-through of what might be the best way to wean him, given both their natures, circumstances, resources, proximity, etc. 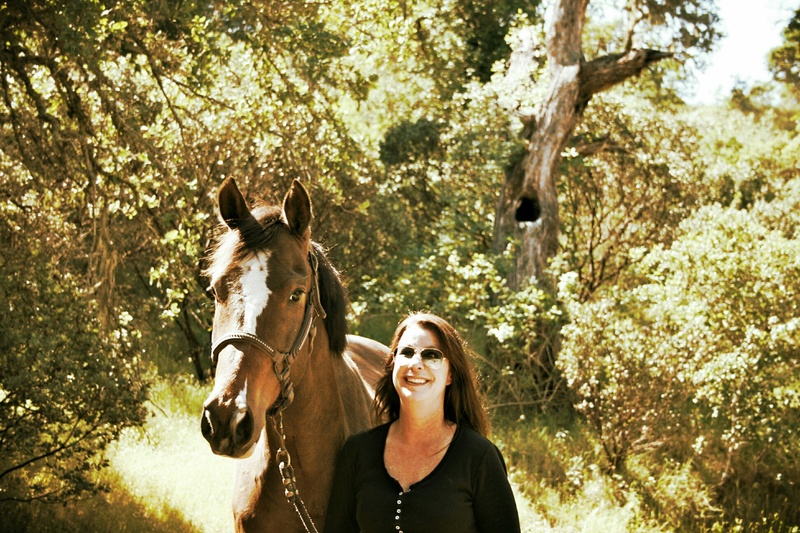 She’s run it by her vet, trainer, very experienced friends. She’s such a good horse mom. To begin the weaning process, Daisy has been regularly walking Murphy out of his mom’s sight (He’s fine, she melts down) and returning him. Stretching the time longer and longer. They’re both dealing with it normally, and relaxing into further distances and longer times. 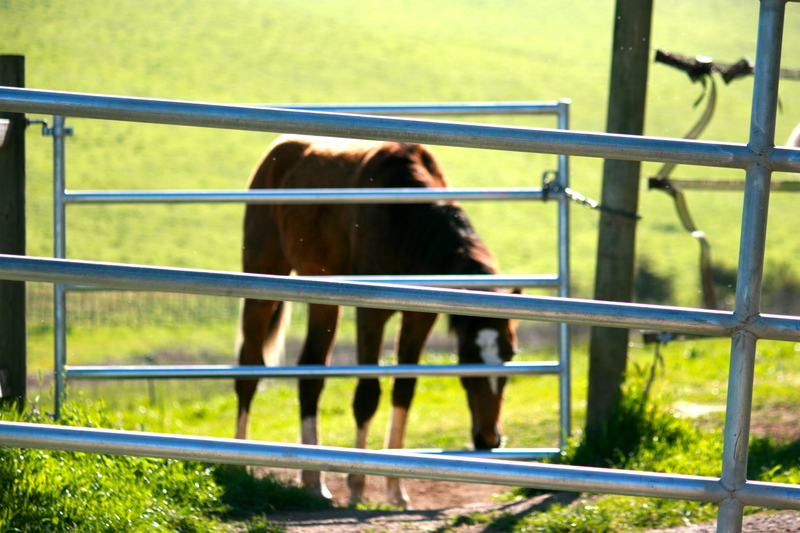 When she takes Barbie out and walks her out of sight – leaving Murphy alone in the pasture – Barbie walks away without a second glance, or an ounce of concern: he’s home, he’s safe. Moving in with Uncle Melody might be a perfect first step. Barbie will be able to see and hear Murphy, she knows Melody, and he would be a good babysitter. Daisy is 5’9″ tall, and Melody is plain huge. Murphy is also less into rump cuddling and back draping. Sniffle, sniffle. I think we need to install hammocks in the paddock. Murphy Vision all day, a book, a cooler full of beverages, a few Zzzzz’s. 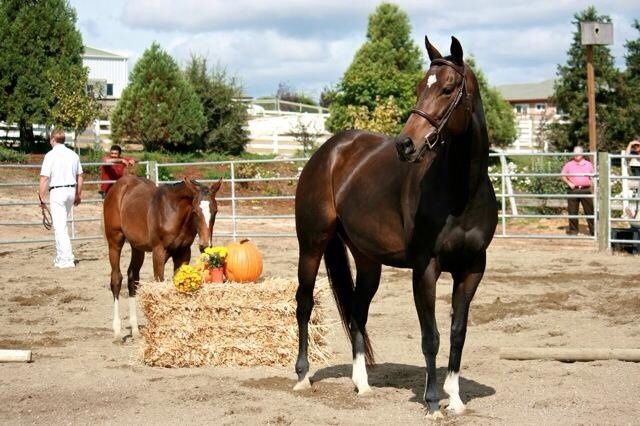 This entry was posted in More Photos Than You Care to See, Murphy Monday and tagged Barbie, Barn Culture, Daisy, Foal, Horse, Murphy, Murphy Monday, postaday2011, Weaning on October 24, 2011 by Jane Clancy. Barbie and Murphy’s RPSI inspection was Sunday. 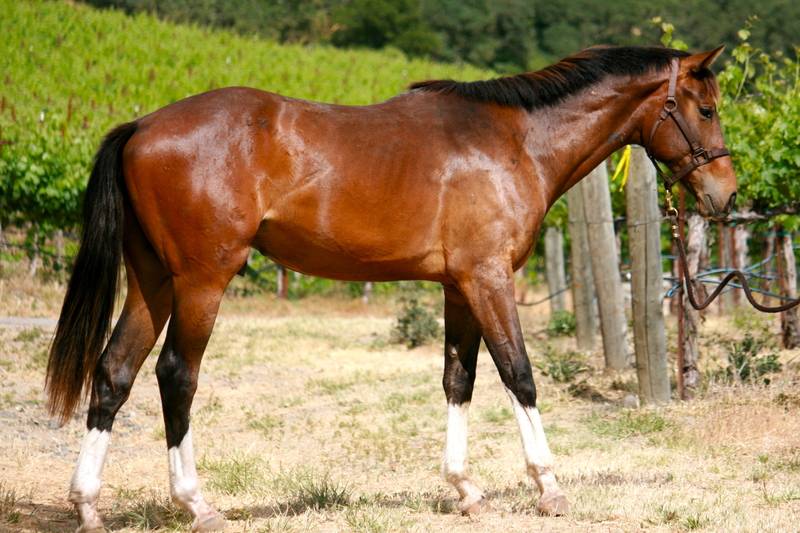 RPSI stands for something I am unable to pronounce, but I’m told is a Warmblood registry. We dubbed ourselves “The M Team”. We joked about getting shirts embroidered, so we’d all match on The Big Day. (We didn’t actually DO this, that would take effort.) When it finally got warm enough for us to peel off our jackets, I cracked up. Everyone was wearing a black shirt and jeans. I guess we know The M Team colors! Deborah works on Barbie, while Bella body blocks from the front. Barbie is standing at the entrance to the trailer. If Bella moves, Barbie will launch herself inside. Daisy gathers allllll the crap you don’t dare leave behind, because you will totally need it if you leave it at home. Murphy loads into the unfamiliar trailer in under five minutes. The boy has courage. The practice trailers were painted white inside. Rock Stars prefer low lighting: The Tour Bus is dim. Bella reported a completely quiet, no scramble ride. All systems GO. The place is packed. Getting in and out with a 4-horse rig does not look promising. Bella couldn’t pull in until she knows how she can get out facing forward. Narrow, busy road with blind hill. Jane decides to help by checking out distances and vehicle positions. Jane, who hasn’t hauled anything in 20 years. Let’s just say it’s a darn good thing Bella decides to check the situation in person. The conclusion: if one car moves, the rig can be maneuvered to get out. There are reasons you should never take Jane (we always use the third person when embarrassed) to important events. See? There was this car? And if it got relocated, Bella would be able to drive the 4 horse rig in a nice loop to get out, instead of backing up with a kazillion miniscule 3-point turns…? Jane makes it her mission to find out who belongs to the car, and get it temporarily relocated. She had no idea she was being, um, directive with the actual inspector. The man who would approve – or not – Murphy and Barbie. Good news: he did not recognize Jane later, in the inspection arena. Here is Murphy seconds after unloading from his first ride in a trailer, standing in a place he’s never seen, with horses calling, squealing, wheeling in paddocks, and people chattering. Not a drop of sweat. He’s surprised, maybe slightly concerned, but going with the program. No drama. Glenhill Farm hosted the inspection with organized grace, professionalism, precision and excellent humor. Lovely facility, lovely owner and staff. Barbie and Murphy wait their turn in a fairy tale stall, deeply bedded with fresh straw, a huge pile of hay to keep them occupied. Their temperaments and beautiful faces are so similar it was both cool and spooky. Finally, the orientation is given, and we check the list for lineup entry. Fourth. Perfect. The trot begins. It was clear the handler very much wanted the horses to present at their best. Here he’s checking to see that Murphy is sticking with, and the pace is good. Then comes the bigger trot, look at that suspension! I’ve never seen a handler with so much air time! 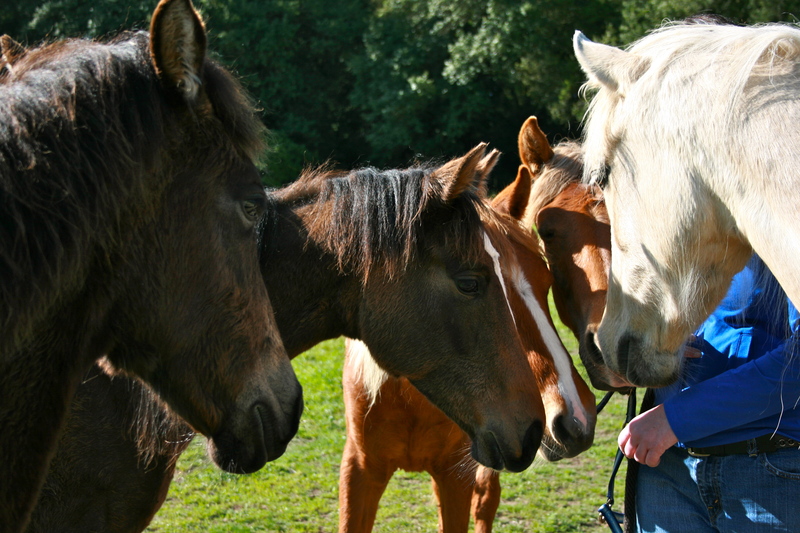 (The horses impressed the inspector too). 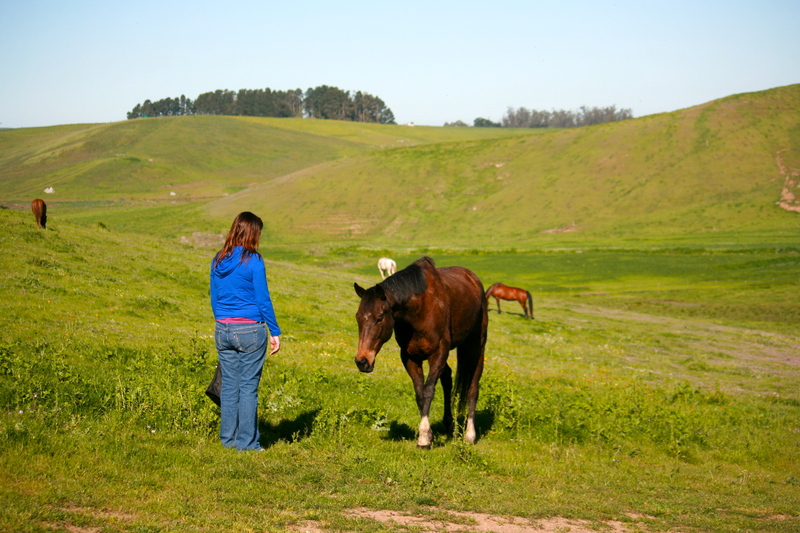 Below is the only canter (ish) picture we have: Murphy thinking about it, Barbie starting to canter. There’s a reason we only have one bad photo. 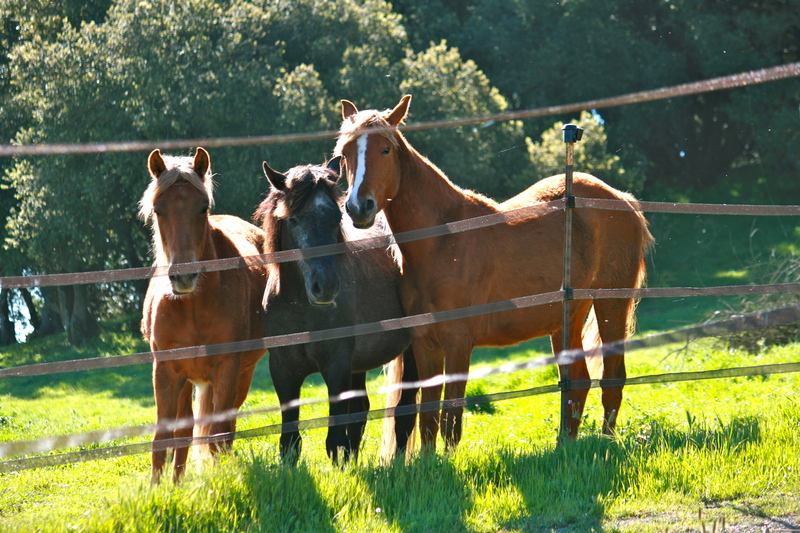 When set free, they canter: beautiful, uphill, lovely to look at. Until…Barbie realizes Auntie Jane is in her show arena. Therefore the show must be over. And Auntie must have treats! The two of them galloped straight for the cluster of photographers (middle of arena), who dove, scattered and gasped, while trying to shoo them out. BEE. LINE. I knew she would stop if I held up my hand, but it would also show the real issue. So I shooed her also. Confused, they barreled past. Wheeled, came back. Totally did not foresee this. We shooed and ducked. At least four times. Finally, the inspector waved and the handler called out “Whoa”. Barbie did an instant sliding stop that would have done Hudson proud, impressing the inspector and handler with her good manners. When no one asked anything else of her, she started ambling toward me again. Daisy shot into the arena to catch Barbie. We wanted the inspector to think she was high-spirited and bold, not hitting the photographer up for a cookie. Murphy decides this is a perfect time to try for a snack, while Barbie is restrained. 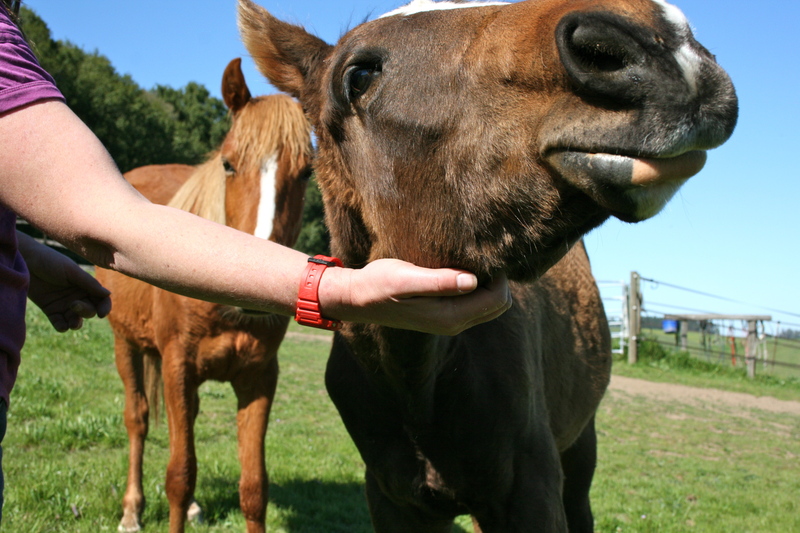 Barbie: Premium mare, brood mare Book One! Murphy: Premium Silver! Their passports (seriously) will arrive in the mail. Here’s Murphy’s plaque! He’s official. 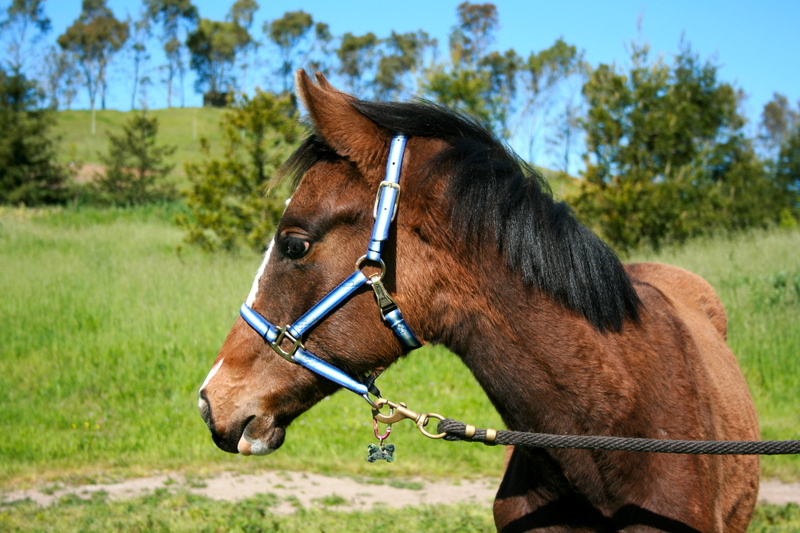 This entry was posted in As The Hot Walker Turns, Barn Culture, More Photos Than You Care to See, Murphy Monday and tagged Barbie, Broodmare, Daisy, Foal, Inspection, Jane, Murphy, Murphy Monday, postaday2011, RSPI, Warmblood on October 4, 2011 by Jane Clancy.